#10 Mike Glennon – He got the first W of the season, now let’s hope he can pass the ball against a weak ATL DEF. He can do it, watch him have a surprisingly nice game this week. #9 Case Keenum – I have him in my top 10 AND over a few big names. He is playing OAK. Foles destroyed their DEF. It’s not that good and Keenum is looking for a W. The stars are lined up for the rookie. #8 Phillip Rivers – He has the receivers, the question is does he have the O-line. If he has a healthy one he will have a good chance going against a drama filled MIA team. #7 Matthew Stafford – Playing for a playoff spot and have all the cards in their hands. Bush is the ultimate play action and even going against PIT Stafford does have this guy known as Calvin Johnson. #6 Cam Newton – Going to be a nice matchup this week and probably game of the week. Watch this game will be pass heavy with some play action on both sides. Two great pass DEF will be ROCKED this week. #5 Nick Foles – He has talent, NOT AMAZING, but he has talent and going against WAS surely helps the cause. #4 Tom Brady – Yes I know CAR has the best pass DEF in fantasy sports but coming off a bye week, getting back to be the “Brady of old”, and getting a running game back you can be assured that the box score will be flashy. #3 Russell Wilson – When you play MIN you are more than likely to break the top 5. He is mobile and I expect a big day from him to be out #3. #2 Drew Brees – Coming off an amazing week against a DAL secondary who needed help everywhere and going against a somewhat more friendly than expected SF defense. You can expect a couple of scores and decent yardage. 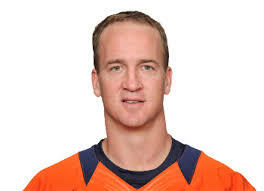 #1 Peyton Manning – I must be having a case of déjà vu look who we have here. So with all the weapons he has, even without the #1 defense in the league not allowing more than 17 points a game he is still up here. Just goes to show talent is here for the HOF even when injured and going against the best in the league.